“I have been a huge fan of LED light therapy for a few years now for it’s ability to stimulate collagen and elastin production, reduce inflammation and accelerate the healing process. It very much supports my non-ablative and non-invasive ethos to treating the skin; by working with the skin to encourage it’s own natural healing process. Until it’s discovery by NASA, the only real way of stimulating collagen production was either through the use of ingredients such as retinoids or through controlled wounding, thus stimulating the body’s own wound healing response. LED light therapy is a safe, painless and effective way of stimulating collagen and elastin production, without any side effects. For those not familiar with this technology, light therapy uses a number of LED bulbs (light emitting diode) to deliver optimised light at a specific wavelength to stimulate a change within the skin, without the need for skin care ingredients or wounding the skin. Making it an effective treatment for all skin types, including hypersensitive and rosacea skins. In a similar fashion to plants, our cells have the ability to absorb light and convert it in to energy. I explain this to my clients with the analogy of UV light stimulating an enzyme reaction that causes our skin to tan. Equally, different wavelengths of light have the ability to stimulate different enzyme reactions that have a different effect on the skin. Red light therapy has a wavelength of between 620nm (light red) to 700nm (dark red) and is predominately used for its anti-ageing benefits because of its ability to stimulate collagen and elastin production. Red therapy also helps to strengthen the skin, thanks to the additional collagen production making the skin more resilient. Making it a very effective treatment for rosacea and reducing the redness that is associated with broken / weak capillaries. It also helps the skin to retain moisture more effectively. Red light therapy is also extremely anti-inflammatory therefore reduces inflammation within the tissues and helping to accelerate the healing process, so is particularly useful for healing blemishes, repairing sun damage, fading scars and improving overall skin tone. 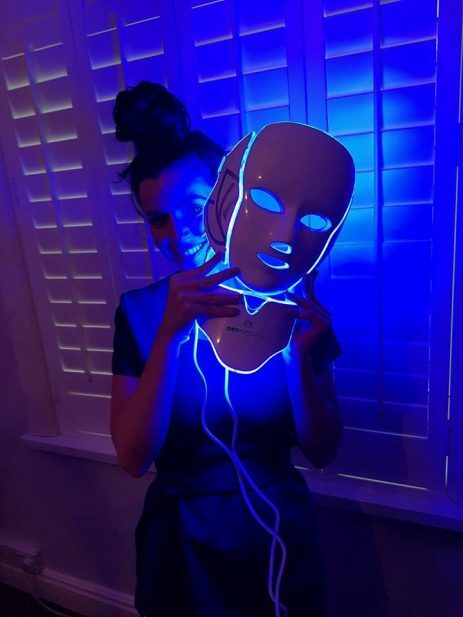 Blue light therapy has a wavelength of between 405nm to 420nm and is predominately used for its anti-bacterial benefits and therefore used in acne treatment. Blue light at wavelength of 415nm is absorbed by a molecule called porphyrin. P.acne bacteria contain an abundant amounts of porphyrin. The absorption of blue light by porphyrin creates singlet oxygen (free radicals) which are released into the bacteria, killing the bacteria. Blue light is also anti-inflammatory. However for best results blue light is used in combination with red light therapy, for its additional skin rejuvenation and wound healing benefits. Amber light therapy has a wavelength of between 570nm to 620nm. Sometimes broken down into Yellow or Orange. Amber light therapy is effective in the treatment of skin issues involving redness such as rosacea. It is ideal for sensitive skin because of its calming and soothing. Amber light therapy helps to flush waste from the skin, boost lymphatic flow and increase cellular growth. The skin effects are boosted when used in combination with red light therapy. Used as a treatment on it’s own or in combination with metabolic peels and dermal needling as part of a treatment plan, the results of LED can be amazing. Call us to book your treatment or learn more about what is available at Renaissance here. We wanted to share this great article about the benefits of LED Therapy by Andy Millward…..